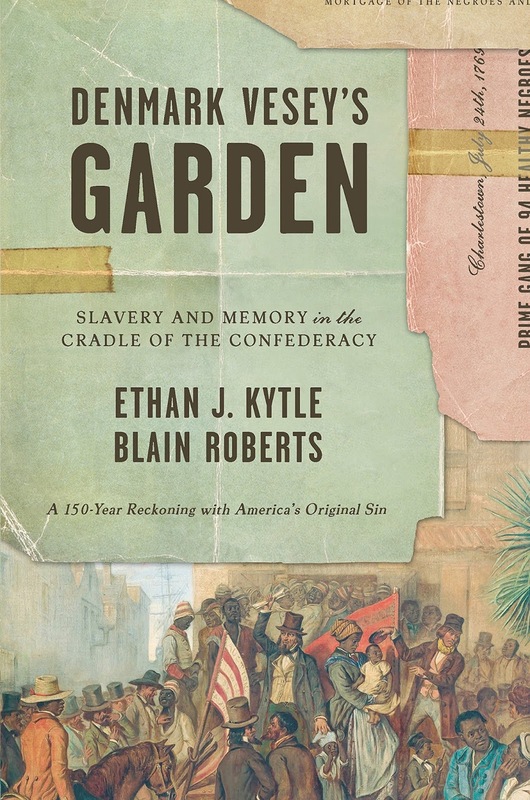 Much along the lines of David Blight's trailblazing study Race and Reunion: The Civil War in American Memory, but taking a much more narrow focus, Ethan J. Kytle and Blain Roberts's Denmark Vesey's Garden: Slavery and Memory in the Cradle of the Confederacy is a timely and relevant examination of how slavery has been remembered in "America's Most Historic City," Charleston, South Carolina. Although we might think the contentious issue of history's memorialization is a current events phenomena, it is not. As the authors clearly show with telling evidence, the contested arena of commemoration is a long fought over battle ground. Following a timeline that runs from the end of the Civil War to the present, the authors show that the predominate white Confederate narrative of slavery, secession, civil war, and emancipation has met with resistance from Charleston's African American community from early on. Of particular importance is the history of the John C. Calhoun monument. Originally much different than the now towering tribute, blacks both mocked and vandalized the statue of the man who proclaimed that slavery was a positive good. It is not so difficult to see that the city's black community did not see John C. Calhoun as an individual to revere because his expressed beliefs and actions ran directly in opposition to who they were. On through the Jim Crow era and into the modern Civil Rights Movement period, Charleston's black community fought to keep alive their understanding and memory of slavery and the Civil War. Often they had to do so with subtle methods due to their social marginalization and lack of political power. However, in their segregated schools and churches they shunned the white "Lost Cause" interpretations and focused on stories of overcoming long odds, individual tales of achievement like Robert Smalls, and keeping alive an unvarnished memory of the difficult Civil War-era. Another section of the book examines the slow evolution of history focused tours in the city proper and on surrounding plantations. Once known for stories of "moonlight and magnolias," of "cavaliers and belles," told to tickle the ears of visiting outsiders, by the 1990s and 2000s a slow movement toward more primary sourced, evidence-based tours emerged which peeled back the layers of romanticized sentimental fluff in favor of a more honest and sometimes emotionally painful look at the past. Both black and white tourists have demanded a fuller telling of slavery and its role in secession, and both black and white tour operators have largely moved in that direction. In the book's "Afterword," the authors put a number of thoughts together very well: "We should not be expected to reject our ancestors for their moral failings. And we certainly should not be held responsible for their actions. This does not give us license, however, to turn a blind eye to our forebears' flaws or the complexity of the world in which they lived. We can pay respect to our ancestors without slipping into outright reverence for them, especially when that reverence leads to . . . historical malfeasance. More important, while it is unfair to ask white Americans today to accept blame of the sin of slavery, it is entirely reasonable to ask that they understand how its memory and legacies continue to shape the daily experiences of whites and African Americans in very different ways." Denmark Vesey's Garden is an important book. It reminds us of the importance to tell history through multiple perspectives, based in solid primary source research, and informed by scholarship. I highly recommend it.